Quieter week with the bylines this time around. I reviewed Columbus for BUST, and interviewed artist Steve Powers about his Philadelphia transportation murals for Curbed Philly! 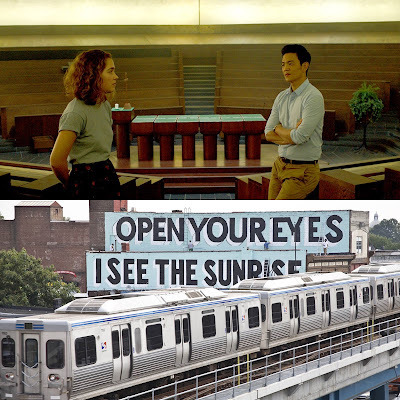 "John Cho, Haley Lu Richardson And Modernist Architecture Make "Columbus" Stand Out: BUST Review." BUST Magazine, September 20, 2017. "Aside from Wes Anderson movies (most notably The Grand Budapest Hotel), I’d never seen a movie that took such care in composing each and every shot — emphasizing orthogonal lines and perfectly-aligned one-point perspective, or creating crystalline moments of symmetry and harmony where a character is shot standing in the precise center of a row of windows. Indeed, the approach to mise-en-scène in Columbus is set up by actual dialogue spoken early in the movie: Richardson’s character Casey is introduced to us while murmuring a sort of tour-guide spiel about the Eliel Saarinen First Christian Church — how even though the door and cross on the building’s façade (and the clock on the tower) are purposefully off-center, they still manage to be balanced and beautiful." "How the Market-Frankford Line became home to 50 love letters to Philly." Curbed Philly, September 21, 2017. "What’s the process of creating one of your murals? It’s like a giant canvas—is it piecemeal, or do you design the whole thing first, or is there some improvisation? "It’s all improv. I had eight of 50 walls even remotely figured out, and we wrote everything else as we went along. It would be like for a recording artist to go in the studio and write songs in that place. So that’s what we did. We were inspired by things that were happening around us. One of the guys we were working with lost his cell phone—he lost his cell phone, he lost minutes—we got him a new cell phone, we got him minutes, and we made one of the wall about that experience. So that’s how I do it. I transcribe—I’m an 'emotional stenographer.'"